There is the pastry lab located under ground (a WW1 bunker) on the Champs-de-Mars a little away from the Tour Eiffel. All base preparations are made here, such as: tart shells, puff pastry dough, short crust dough, confiture, coulis, ganache, glacage, macarons, biscuits, sponge (genoise, joconde, dacquoise), marshmellows, ice-cream, infusions, and so much much more! And every morning a storage container filled to order by the lab is sent to Level 2, Le Jules Verne, Tour Eiffel. The pastry kitchen is smaller and is seperate from the cuisine . Where cuisine may have a team of 20 people or more, the pastry team is a teeny size of 3 to 5 people and five is one too many. The lifts can take 7 minutes approximately to reach you. If you miss the lift, you then have to wait for it to go all the way up, 125 metres, and then all the way down, 125 metres again, and it makes a stop both ways. There is only one lift for all workers, and unfortunately for those who arrive fresh + clean we must share the lift with contruction workers , delivery guys, security, electricians, most of whom seem to be unaware of a product called deoderant. Therefore to not be delayed by the lift and to avoid being canned in with bad BO, I like to arrive to work around 6:30am. Grab blue apron, white apron + Toque from the pantry. Put on blue apron and put aside the white apron and toque for SERVICE later. Wash hands. Disinfect. Turn on the oven, pre-heat to 150°C (23 mins) for savory finger sesame cheese crackers called Celemantel (spelling, I’m not sure). There are 4 trays to go in. Whip the Madagascar Vanilla Chantilly for the Baba au Rhum: I scrape the seeds out of 2 vanilla pods which are just superbly fragrant. I measure out 2 litres of créme and 160g of icing sugar and bung it all together into the mixing bowl of an electric mixer. The Chantilly musn’t be too firm because the idea is to serve a dollop of cream over the Baba au Rhum in front of the customer. I didn’t know this at first and I had been making chantilly quite stiff and when the waitstaff tried to serve the chantilly embarressingly it wouldn’t leave the spoon. While the Vanilla Chantilly is whipping I take care of the Carrés mignardise. There are hundreds of little genoise sponge squares (1.5cmx1.5cm) with a layer of confiture (prepared earlier by the lab), over this I must put equal in size pre-cut squares of chocolate and the thickness of this chocolate is paper thin. Whip up an infused cream in the electric mixer, but this time whip until firm peaks because it’s intended to be piped into perfectly round balls, a ball for each Carre mignardise. There must be over 200 pieces. There are two infused creams I’ve come to discover for the Carre mignardise, the first is Crème d’Orgeat. Orgeat comes from almonds, and the syrup is available in French supermarkets. The Carre mignardise is like this: genoise sponge, then a raspberry confiture, then a piece of square white chocolate paper-thin, over this a perfectly piped ball of Crème d’Orgeat Chantilly and pop on on white chocolate square. The second, Crème Romarin, a cream infused with Rosemary. It is superbly delicious! The genoise now has a layer of apricot confiture, over that goes a dark chocolate square, a perfectly piped ball of Rosemary Chantilly, then dark chocolate on top. Pipe perfect balls of Chantilly, crème d’orgeat or crème rosmarin over every carré. Then I finish the mignardise by placing a square chocolate over the cream ball. Place a baking sheet of paper over the lot and place in fridge. The sheet of paper will absorb the moisture or condensation. This mignardise is one of three to be served. 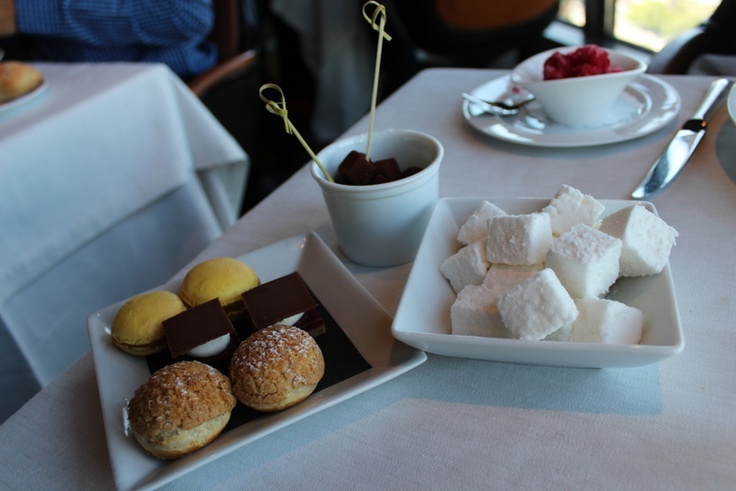 The mignardise is complimentary for every table. Pâte à Choux in the oven, another mignardise. On top they wear a little round yellow coloured disk hat which is an almond pâte we say in French. We did these choux in Ferrandi, you can do all sorts of colours. The choux when cooked with be a ball and over it is a crackling coloured skin. I put the dough of choux in the oven. This cooks at 135°C (30 minutes). Remove from oven and cool. Now time for escargo puff pastries wrising to towery salted croissants. Imagine a pizza dough rolled up, then cut up into 3 1/2 cm pieces, now from its side turn it up and placed into the middle of metail rings then a plastic sheet is placed over 16 rings (x6 by x4) then into the proofer to rise for one hour. After 1 hour we sprinkle Frances best sea salt, sel de Guérande. This is a croissant dough, it will puff up into salt crispy flakes. Into the oven at 200°C (11 minutes). This has to be my favourite. Those that have not risen well, the staff eat. When the 4 trays have been baked and cooled down, I then arrange them onto 2 racks. This is then given to Service, another complimentary item. The Celemantel savory biscuits would have cooled by now so I collect them and pack them up for the WAITSTAFF (SERVICE en francais) to arrange them elegantly in mini glass flutes. Then I must sought the raw Celemantel out into parallel lines of little soldiers onto the 4 trays, these will be baked for tonight or next morning. The trays must be prepared ahead so the next team all they have to do is pop them into the oven. The Choux would have cooled down by name. Pierce a hole on the bottom of 140 choux. After lunch fill them with Thyme infused Crème Pâtissière. Around 8:30 we receive a delivery of goods from the lab, it arrives in what I can describe resembles a portable loo on wheels. It’s called the ‘Rolls’ or ‘Royce’, I can’t remember exactly but in my head I remember it as Rolls Royce. This moveable storage waits for us on Level 2, kinda like Santas gifts. In there we have our order of macarons, tarts, confiture, all the stuff that’s been brought up by the lab. Like robbers to a bank volt we clear the storage loo of all its contents and fill our pastry kitchen full of it. My gifts are 2 trays of macarons. I must sort through them and throw out (or eat) broken ones or any that are ill fit for service. I then sort 140 perfect macarons ready for service. The rest are prepared for tonights service. Remember those puff pastry dough escargots? Well, in the Rolls Royce loo-like on wheels are those long pastry doughs, imagine a pizza base rolled up, well like that. They’re frozen, they’ve come like that from the lab. I must take 11 of them and cut each roll into 3 1/2 pieces, place them across 2 trays and that will be for tonights service. They will then do what i did and put them in metal rings for baking. Take tart shells for the Rhubarb dessert. The tarts shells are obviously empty prepared early by the lab. I’m to chop tiny bits of cooked rhubarb and fill the shell with it, then fill the shells with appareil, in French it’s a flan liquid. This goes into the oven, 160°C (35 mins). At the same time I pop in the round sweet coconut flavoured dough biscuit, this is the base of the strawberry dessert as well as the citron dessert, 160°C (10 minutes). It’s 10:10am, it’s time for cleaning. Wash floors, cupboards, utensils, finish the dishes and drying. This is a full team work. We also check the fridges and cupboards and make a list of what we need to stock up on. Must be done 10:30am. We go to cuisine pick up our plate of whatever is served, head straight to the formal dining area of Le Jules Verne restaurant. 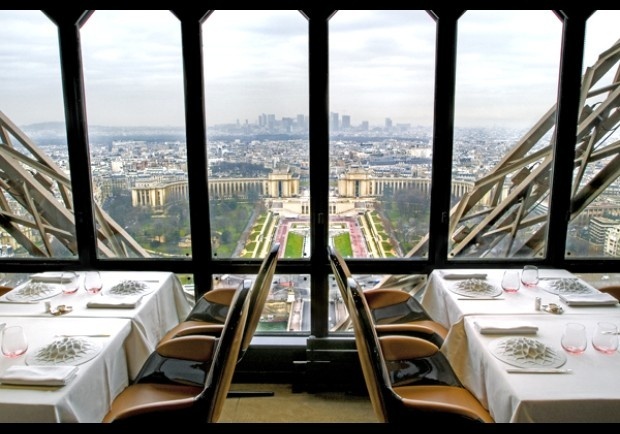 We eat, no time to digest and off we head downstairs, out of the Tour Eiffel and straight towards the laboratory on the Champs-de-Mars. All of the pastry kitchen staff go, we say, “Bonjour (kiss, kiss), Salut. Ca Va?” to every single person in the lab. That’s France. We follow our list talk to the Chef of lab and get what we need, we also return stuff we don’t need. SERVICE for miss pirisi, 11am – put on Toque and white apron. Fill 140 choux with Thyme infused crème pâtissière using piping back and piping nozzle (tip). Prepare plates for mignardise (Carre, Choux, Macarons) and organise mignardise across 120 to 130 plates. As the table numbers are called for SERVICE I must do a final touch on the plate make sure the mignardise are presentable and clean the plates with a white cloth before they get pick up by Chef and put on the silver plateau for SERVICE before heading out to customers. The dockets will be called out by Chef, “A suivre”, to follow. When the plates are ready to go out, the table is ready to eat dessert, a second docket comes through, “Je reclame”, I’m asking / I demand, it means get it ready RIGHT NOW, it’s going out within seconds. Then you have “A voir”!, this is the first docket meaning the customer doesn’t know which dessert they want yet and will decide later, therefore when the second ticket comes through it will be “En direct”, direct/right now. Each time Chef reads out a docket the team must respond, “Oui!”, even if he’s calling out a dessert that’s not yours to prepare. When Chef talks to you directly, you must say, “Oui Chef!”. Peel a bathtub quantity of rhurbarb and cut into finger sized lengths. Okay, “bathtub” might be exaggerating, but a very big bunch which by the way my Chefs offer to help me with. This rhubarb will be cooked and then prepared for plating for the tart rhubarb meringue which is probably the best of all the desserts, there is an ice-cream fondant centre, and guess what? not that many people order it simply because they don’t know. Service can finish around anywhere from 2:30 to 3pm. 4pm Finish work, change into civilian clothing: high heels and a skirt, yes please! I’ve plated desserts, Mara des Bois, Baba au Rum, and Ecrou chocolat. I actually did a lot more on my first week. My Chef even said to me, “Next week (2nd week) you’ll be doing this all on your own”. It freaked me out but I was super excited all weekend I was so ready for the challenge. The service call out is fast, you’ve got to assemble your plate and have it ready for the pass out in seconds. But a new girl was hired replaced someone else and everything I was being shown and doing she is now learning and doing, so I’m back to just the list above. It’s a damn shame because I could be very good at plating desserts. But that’s being a stagiaire/intern. I knew that. Unfortunately being a stage I can only be worked a max 35 HOURS, 5 days a week. A full time employee works 6 days a weeks, sometimes all day. And the new girl can do those hours I’m not legally allowed to do even if I wanted to. In France, the Unions are powerful and companies can be penalised big time if they don’t follow the rules. 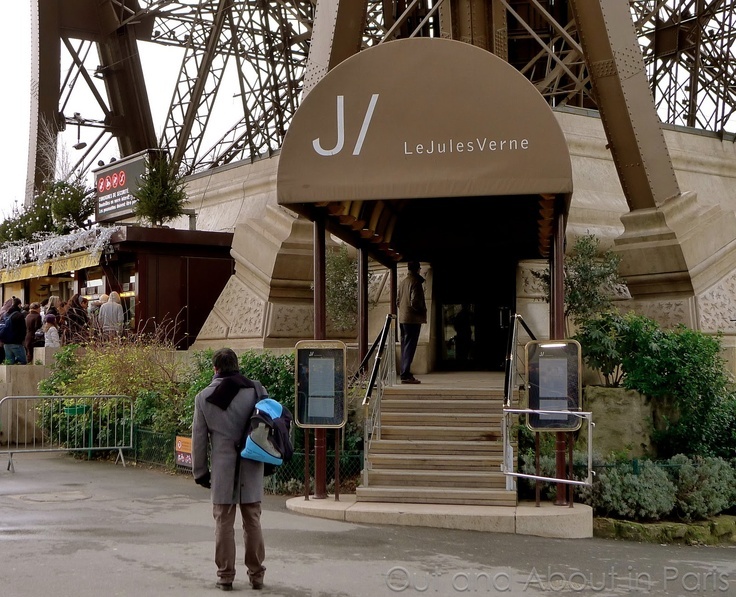 I’ve started my internship this week at Le Jules Verne as an intern pâtissière, Tour Eiffel (Eiffel Tower) in Paris, and I will get details up on how its going as soon as possible. For now my posts remain in drafts. So far it’s been 3 days only but it feels like a week, in a good way. I’ve been learning heaps, watching and doing a lot. Im also taking the instructions in French which means I have to be double attentive. I like the speed during kitchen service. I’ve assembled, prepared and even plated desserts. I like that the kitchen is small – there’s less to clean. I like that I am not 1 of 9 interns. I am the only one. I like the repetition for the moment because it allows me to practice. I think Im lucky with the Chef I have, he’s certainly hard on me but he’s fair and he takes care to teach me and pays attention to the team to ensure they’re showing me things. That’s pretty cool. I like the idea that there are clients anticipating what Im putting together for them. Especially when I hear the Chef say, “VIP client”, and I watch my plate go out. I would like to work faster so that I can advance to do more complicated things. I like that at Jules Verne there is the opportunity for two internship experiences: the restaurant service where you work in the restaurant learning to plate desserts, and then there is the laboratory where you do all the preparatory patisserie stuff as you would in a boutique patisserie. I love that my office building is the Tour Eiffel (Eiffel Tower). I take the lifts up 125 metres and that’s only to level 2! In the morning during my lift ride I have my very own special moment with PARIS. She’s so beautiful at 7am.